The adult German Cockroach is 13-16mm long and light-brown to tan in colour, with two dark, parallel stripes on its head. It has semi-transparent brown wings, which are about the length of the body, although it seldom flies. The female adult will often have a large, yellowish-brown, oblong egg capsule attached to its abdomen. Juvenile German Cockroaches are smaller, rounder and lack wings. The Female German Cockroach will carry its eggs until they almost ready to hatch, at which point it will deposit the egg capsule in a sheltered location. The eggs will hatch and then progress into several stages until reaching adult after about 3 to 4 months. The adult will live for a further 4 to 7 months. German Cockroaches prefer warm, humid locations near sources of food. Kitchens and food storage areas are ideal habitats for German Cockroaches, as are adjacent bathrooms, bedrooms or any location where people live and eat. They will live in cracks and voids in walls, cupboards, furniture, boxes and electrical appliances. They will remain secluded in these dark areas, and prefer to come out and forage for food only at night. 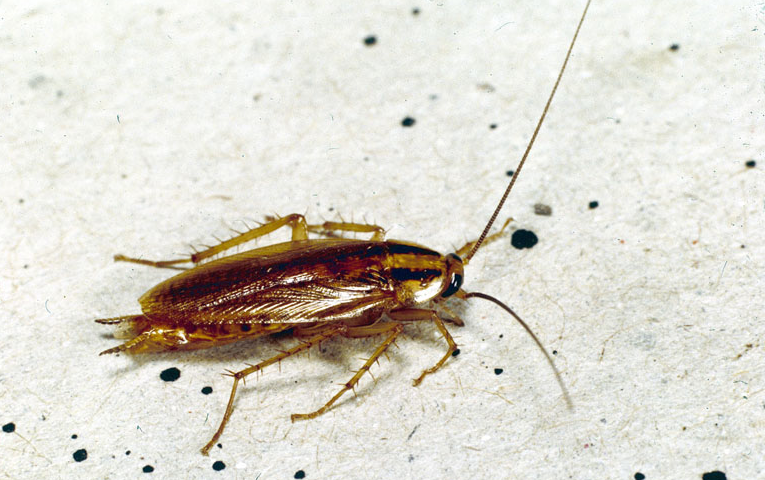 German Cockroaches can enter the home from grocery bags, cardboard boxes and used appliances. They can also migrate from neighboring structures when those structures have a heavy infestation. Good sanitation is essential in preventing a large infestation of cockroaches, although sanitation alone may not be enough to completely eliminate the pest. Reducing food residue around the kitchen is essential, including around the floor, cupboards, and trash receptacles. Appliances such as refrigerators, coffee makers, microwaves and stoves must be thoroughly cleaned of food particles. Reducing clutter will remove hiding areas for the pests, and thorough vacuuming regularly around these areas will remove food and exposed cockroaches. The best control method is a cockroach baiting program preformed by a professional technician.